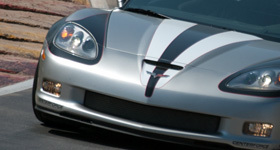 Absorbent Glass Mat (AGM) batteries have turned that technology on its head. 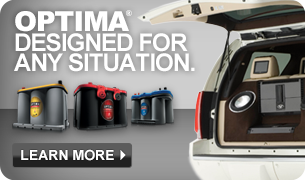 Of course, turning a traditional flooded battery on its head would cause spillage, one of the problems AGM batteries, like OPTIMA® batteries, help you avoid. OPTIMA AGM batteries also use a higher purity of lead than many other AGM and typical flooded cell batteries at 99.99% pure, virgin lead. 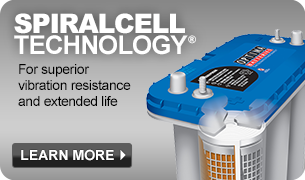 This higher purity means fewer contaminants and a lower incidence of gassing, which extends battery life and increases performance. The OPTIMA battery’s design advantages include lower internal resistance and greater plate area for superior starting power, the ability to recharge much faster, and higher voltage characteristics during discharge. And it’s virtually spill proof, whether it’s cracked or damaged. 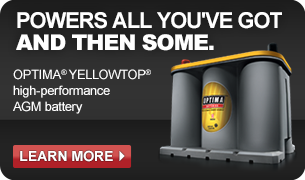 Also, OPTIMA AGM batteries withstand vibration like a champ.